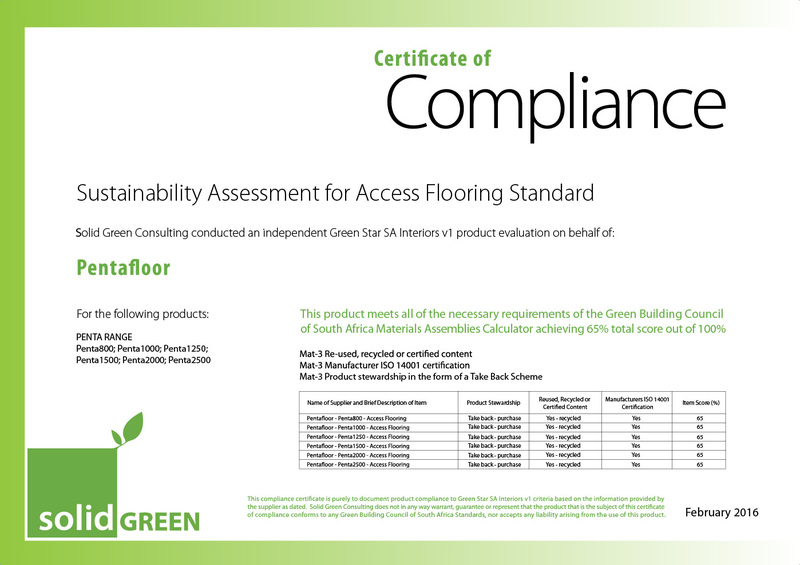 Pentafloor is a proud member of the Green Building Council South Africa (GBCSA) and is committed to sustainable development in Africa. 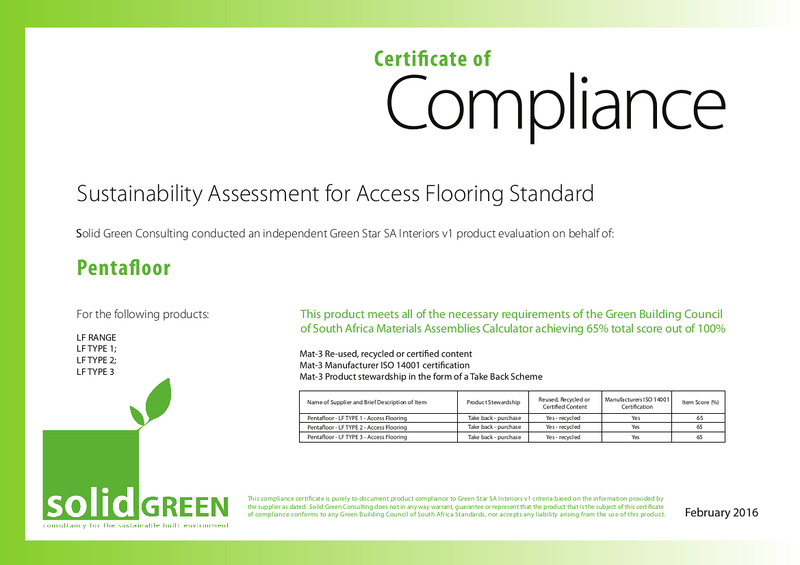 As a sign of our dedication to creating and supplying flooring products that are not only attractive, affordable and of a superior quality, but also take into consideration our environmental responsibility towards future generations, Pentafloor has had its products independently verified by Solid Green Consulting, South Africa’s largest dedicated green building consulting firm. 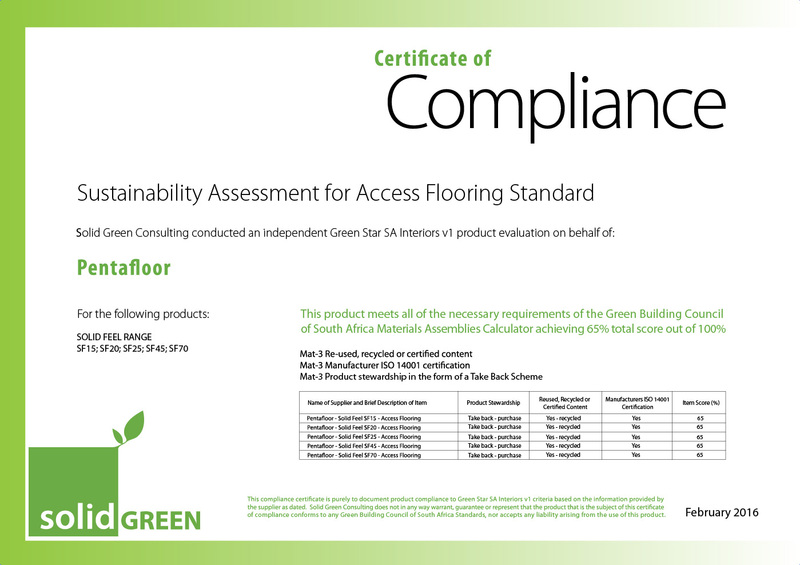 Pentafloor is the exclusive distributor of Shaw Contract products in South Africa. As the world’s largest carpet manufacturer and a global supplier of carpet tiles, broadloom, and resilient flooring to the residential, commercial, hospitality, retail, healthcare and education sectors, Shaw is committed to sustainability and transparency. Shaw is committed to the Cradle to Cradle Certified Product Standard, which looks at a product through five quality categories — material health, material reutilization, renewable energy and carbon management, water stewardship, and social fairness. 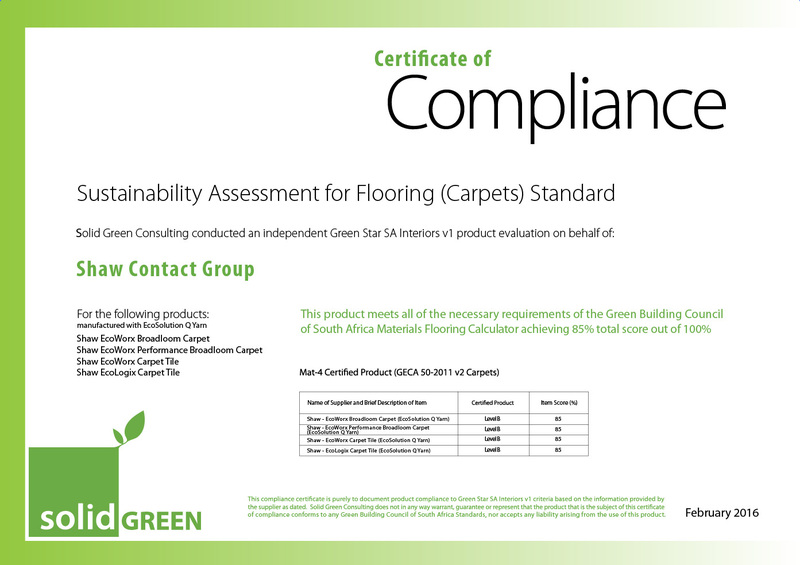 All Shaw’s EcoWorx products with EcoSolution Q nylon are Cradle to Cradle Certified™ Silver and optimised for impact on human health and the environment. In addition, Shaw’s commitment to transparency and material health complement the philosophy of the WELL Building Standard, which is gaining traction worldwide in terms of prioritising occupant health and wellbeing. Shaw products contribute to the following WELL standard requirements, among others: VOC Reduction, Fundamental Material Safety, Toxic Material Reduction, Cleanable Environment, Beauty + Design, and Material Transparency. The annual Shaw Industries corporate sustainability report is compliant with Global Reporting Initiative (GRI) standards, addressing Shaw responsible sourcing practices and meeting Leadership in Energy and Environmental Design (LEED) requirements for full contribution to this credit. Shaw Contract is also an approved Mindful Materials manufacturer.